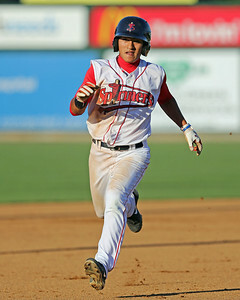 Season in Review: Lin drew an assignment to Short-Season Lowell in his first full pro season. The slick-fielding shortstop had a campaign to forget at the plate, trending downward as the season went on, perhaps due to the fatigue common in young players adjusting to the grind of pro ball (see more on this below). Things culminated in a .167/.247/.179 line in August as he went 14 for 84 and ceded a healthy number of starts to GCL call-up Deiner Lopez in the latter half of the month. Lin did show some proclivity for drawing walks early on, drawing 17 as compared to 22 strikeouts in his first 27 games, but that ratio skewed to 11 to 37 in the final 32 games. First-Hand Report and 2014 Outlook: The first thing that stands out with Lin is his lack of size. He has a small frame and lacks present strength. He is athletic and looks very natural on the diamond, but I do not see much projection in his body as he matures. Presently, his glove is ahead of his bat and he has the potential to be a plus defender at a premium position. His actions are smooth at short and he has plus range. He has strong defensive instincts reading the ball off the bat and takes good angles to the ball. Presently, his arm is only average to slightly above-average, but he has a quick release and has shown the ability to make the throw from deep in the hole. Lin does have a tendency to get a little lazy with his footwork and take things too casually, resulting in a few too many errant throws and misplayed ground balls. Photo credit: Myles Smith by Lee University Athletics, Tzu-Wei Lin by Kelly O'Connor.